Wohhh it was great when I heard this astonishing truth that Facebook is giving Rs50 talk time to its new users who join facebook via mobile. Facebook has quietly launched this new talktime offer to lure new registrations via mobile phones by offering talktime worth Rs 50 for free in return. 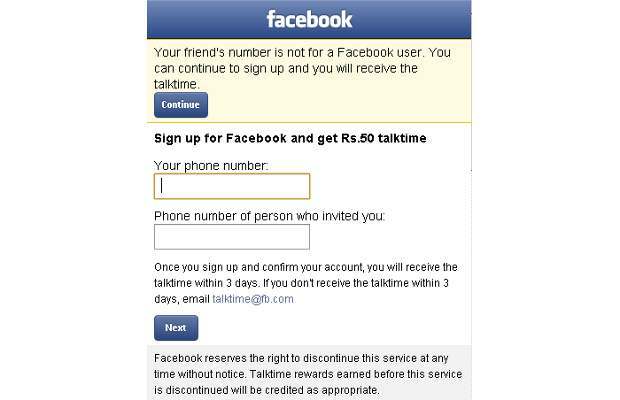 Popular social network, Facebook has started a programme in India under which it is offering new users free talktime worth Rs 50. So if a user registers himself/herself to Facebook through mobile using the URL - m.facebook.com/tt, his mobile number would get credited by Rs 50. Obviously, this offer is meant for new registrations only and is valid for registrations through mobile only. After registration, a user has to provide his mobile number on the Facebook Talktime page. "Once you sign up and confirm your account, you will receive the talktime within three days," Facebook said. Facebook has currently around 50 million users in India, 30 per cent of which reportedly access the social network through their mobile phones. It would thus be interesting to see how many Indian users actually signed up through this offer. Also if it becomes successful, Facebook would have a large database of phone numbers belonging to Indian users who voluntarily provided them during registrations. It would be interesting to see if any other social network would like to take the same route of offering free talktime or freebies just to register and join a social network. 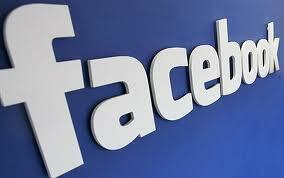 So guys what are you waiting for have your 1st free talktime joining facebook via mobile.....enjoyyy. For more such news stay tuned by joining this blog(click on join this site under Be a Part of Amazing Technology).